Mark your calendar to come and watch the finalists compete in IUPUI's 2019 JagStart Elevator Pitch event on April 12, 2019. Learn from these finalists -- and 2020 could be the year your idea wins! 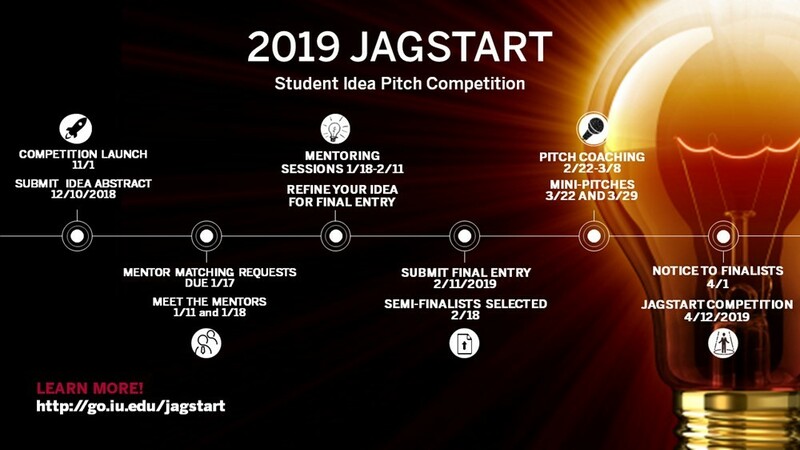 JagStart is an “ideation” competition to reward students for their innovative ideas. The emphasis of the competition is on finding answers to real-world problems through new approaches, products, services, or ventures, both traditional commercial enterprises and non-profit solutions to pressing social and economic challenges. Students submit written summaries of their original ideas, and finalists are chosen to move forward to the final stage of the competition. Finalists will present their ideas to a panel of judges in an “elevator pitch.” An elevator pitch is a brief (three-minute maximum) pitch, one just about as long as an elevator ride, which presents your ideas in a concise, brief, and persuasive manner. Elevator pitches are continually becoming a more common practice for employers while screening applicants. Practicing and perfecting this skill, therefore, gives participants a leg up on the competition. Even better, winners receive cash awards—the 1st Place Prize is $2,500. The Office of the Vice Chancellor for Research (OVCR) launched the JagStart competition to support students and development of their ideas. By encouraging entrepreneurially-oriented students to develop their concepts and teaching them to present their models in a persuasive manner, the program provides mentorship to the next generation of innovators. 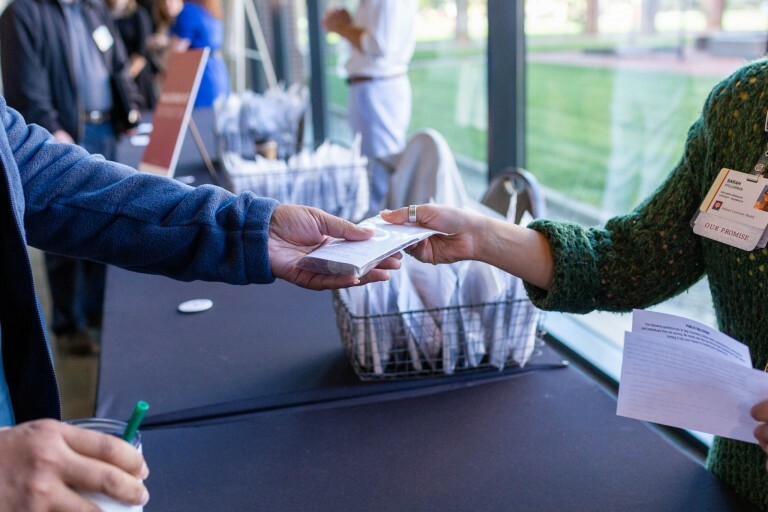 The JagStart competition offers students a real-world forum where they will receive constructive feedback from local experts in the community. Capture and retain the attention of possible sponsors, investors, or other potential supporters within our community. JagStart is open to all students (undergraduate, graduate, and professional) enrolled in the current academic year (including December graduates), full- or part-time, pursuing a degree in any of the Indiana University-Purdue University schools at either the Indianapolis or Columbus campus. Students can submit ideas individually or as a team. Ideas presented can be in any stage of development, but must be “pre-revenue” ideas (or “pre-operational” for non-profit ideas). Pitch presentations must be conducted without props, slides, or other visual aids. Local experts and professionals will judge the pitch competition. The competition progresses in three stages: 1) a first-stage entry in the fall with submission of an idea abstract; 2) a second stage in the spring, with a submission of a full written entry used for selection of finalists; and 3) the live “elevator” pitch JagStart Competition event at the IUPUI Student Research & Engagement Showcase on April 12, 2019..
For more info, contact Karen White, Research Development & Commercialization Facilitator, Office of the Vice Chancellor for Research (OVCR), at kfwhite@iupui.eduvvvv. Have you heard about Indiana University’s experts database? It enables you to share your expertise and provides information to the media and public on breaking news, interesting trends, or novel research. The database allows users to search for IU faculty or staff members who can offer expertise on a wide array of disciplines. It can be searched alphabetically, by campus, or through the use of keywords. Nearly 900 IU experts are currently included, and new submissions of faculty and staff experts are continually accepted. Interested in speaking to the media or public about your area of expertise? Simply fill out the online form to be included. The goal of the 2019 SEIRI Seed Grant (SSG) competition is to facilitate and support STEM education innovation and research at IUPUI. Specifically, this opportunity provides faculty members in science, technology, engineering, and mathematics (STEM) departments with funding to develop, implement, and evaluate the impact of pedagogical innovations across multiple IUPUI STEM courses. 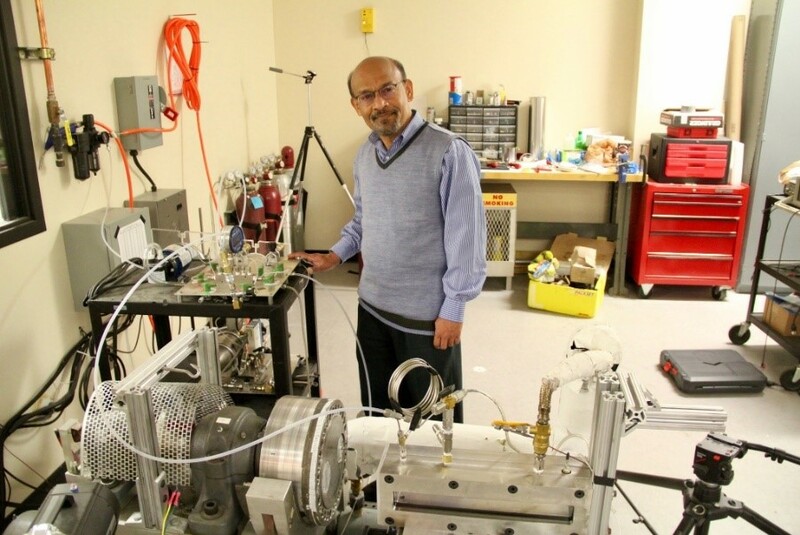 As a long-term goal, this grant is intended to enable faculty competitiveness for external funding with agencies such as the National Science Foundation (NSF), Spencer Foundation, and the National Institute for Health (NIH), or other internal funding such as the IUCRG. SEIRI strongly encourages that interested STEM faculty partner with an educational research or design expert within fields related to the learning sciences, such as, but not limited to, IUPUI’s Department of Psychology or School of Education. Projects are eligible for an award of up to $30,000 each. 2019 SSG final proposal applications are due by 11:59 PM EST on Monday, May 13, 2019. Direct any SSG-related questions to seiri@iupui.edu, 317-278-0168, or visit SEIRI in Room 1123 in the University Library. Additionally, please save the date of April 25, 2019, to attend the Inaugural SEIRI Seed Grant (SSG) Symposium, to be held in the University Library, Lilly Auditorium. More info to come. 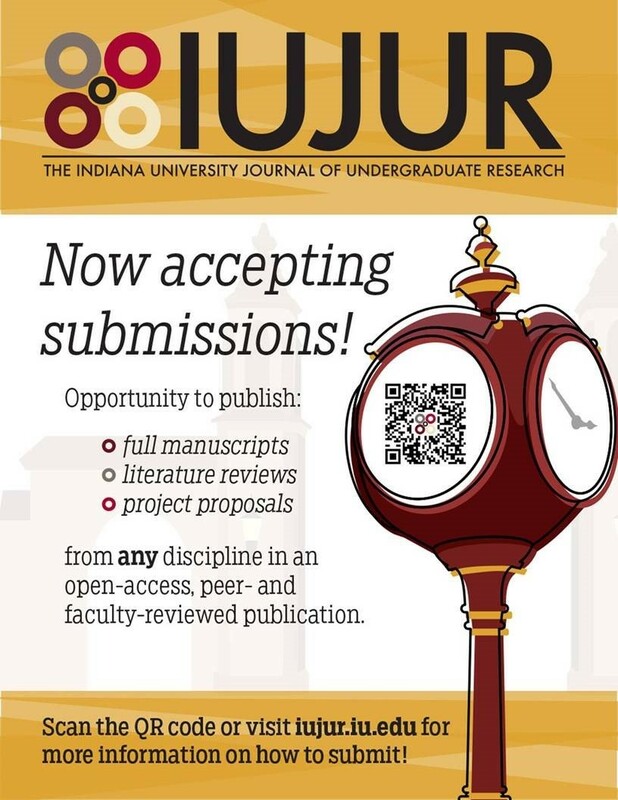 Students are encouraged to submit research papers to the IU Journal of Undergraduate Research (IUJUR), which is currently accepting submissions for its 2019 issue. The IUJUR is an annual, open-access journal published in June of each year. You have the exciting opportunity to publish your work in any area of research in any language as a full-length paper, review article, or research snapshot. Quality research done for a current/previous class is also acceptable, as long as you work with a faculty mentor to prepare it for publication. If you are interested in submitting your work, please consult our submission guide. Feel free to contact iujur@indiana.edu with any questions or requests to meet with student editors for further guidance. Three Indiana University centers will receive $45,000 of a $200,000 federal Health Resources and Services Administration planning grant as part of the Indiana Rural Opioid Consortium. The Indiana Rural Health Association is convening the consortium to collaborate on plans to address opioid abuse in rural Indiana communities. The consortium includes the Center for Rural Engagement at IU Bloomington, the Bowen Center for Health Workforce Research and Policy at the IU School of Medicine, and the Center for Public Health Practice at the Richard M. Fairbanks School of Public Health at IUPUI. The consortium supports prevention and treatment for substance use disorder, including opioid use disorder in the rural Indiana counties that are among the 220 counties across the U.S. identified by the Centers for Disease Control and Prevention as being at risk for HIV and hepatitis C infections due to injection drug use. Increasing access to available treatment options, including new telehealth options. Building additional recovery communities in the targeted counties. Creating initiatives and programs to reduce the stigma associated with addiction resulting from the opioid crisis. The consortium will also identify strengths and gaps in existing programs and additional means to expand continuity of opioid use disorder care that includes medication-assisted treatment and waivers available through the Drug Addiction Treatment Act of 2000, as well as other recovery initiatives. "Even with increased national attention and the addition of select prevention and treatment facilities throughout Indiana, opioid use disorders remain a chronic, persistent and very serious public health concern in the state, including rural areas," Indiana Rural Health Association Executive Director Don Kelso said. Indiana University will identify opportunities and gaps in prevention and treatment, a workforce plan, and a framework for community-based programs to address stigma. Additionally, IU will promote academic programs and activities, develop educational materials and curricula, and facilitate professional development initiatives to connect providers and peer recovery leaders to the training they need to positively impact opioid issues in Indiana. The Center for Rural Engagement at IU Bloomington improves the lives of Hoosiers through collaborative initiatives that discover and deploy scalable and flexible solutions to common challenges facing rural communities. Working in full-spectrum community innovation through research, community-engaged teaching and student service, the center builds vision, harnesses assets and cultivates sustainable leadership structures within the communities with which it engages to ensure long-term success. The Bowen Center for Health Workforce Research and Policy at the Indiana University School of Medicine, Department of Family Medicine, serves to advance policies that improve human health and well-being through commitment to service and research contributions. The Bowen Center is dedicated to advancing this mission through a partnership with the state of Indiana and collaboration with a myriad of stakeholders, including health professional training programs, provider organizations and nonprofit agencies at local, state and national levels. The Center for Public Health Practice at the Richard M. Fairbanks School of Public Health at IUPUI helps practitioners by increasing local public health value in Indiana through public health accreditation preparedness; providing technical assistance to local health departments around community-identified public health needs; enhancing workforce capacity building through authentic, community-centered learning opportunities for public health students; and supporting the Indiana Public Health Practice Council, an inclusive, statewide group that brings together representatives from state universities, associations, public health practice and policy-making bodies. Indiana University has made it a priority to bring IU experts and resources to bear to help combat the devastating effects of addiction. IU's Responding to the Addictions Crisis Grand Challenge engages a broad array of IU's world-class faculty, as well as business, nonprofit and government partners, to create a comprehensive plan to reduce deaths from addiction, ease the burden of addiction on Hoosier communities, and improve health and economic outcomes. This collaborative, statewide initiative is the nation's largest and most comprehensive university-led response to the opioid addiction crisis. For more on the goals of the Indiana Rural Opioid Consortium and how they relate to IU’s Responding to the Addictions Crisis Grand Challenge, read the News at IU post. The Religion, Spirituality & the Arts Seminar (RSA), a project of the IUPUI Arts & Humanities Institute, invited 12 Indiana artists to explore and expound upon the story of Lot’s Wife during the eighth annual Religion, Spirituality and the Arts Seminar and the accompanying art exhibition. 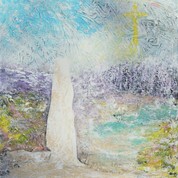 Artists include Stan Blevins, Peggy Breidenbach, Alys Caviness-Gober, Marjie Giffin, A. Paul Johnson, Kasey May, Michael McAuley, William Peacock, Katherine Simmons, Jennifer Strange, Teresa Vazquez, and Kevin Wilson. Directed by Rabbi Sandy Sasso, the RSA Seminar explores the varieties of religious experience and understanding. Through seminars led by an interdisciplinary faculty, artists gain the knowledge and inspiration to develop new artistic works. Artists share their creations through exhibitions and presentations to members of the Central Indiana community, including religious organizations, schools, libraries, and community groups. On March 7, 2019, the first public exhibition of the 2018-19 RSA Seminar’s work will open featuring new works of painting, sculpture, music, and poetry developed by the cohort. A reception begins at 5:30 p.m. with performances beginning at 6:30 p.m. The exhibition will remain on display at the Jewish Community Center of Indianapolis through April 30. This opening event and exhibition is free and open to the public at the Jewish Community Center of Indianapolis (6701 Hoover Road, Indianapolis, IN 46260). Refreshments will also be served at the March 7 reception. Register here now. 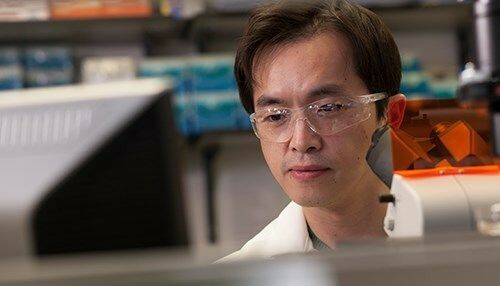 The School of Engineering and Technology at Indiana University–Purdue University Indianapolis has revealed that the National Institutes of Health has awarded a four-year R01 grant of $1.5 million to Chien-Chi Lin, associate professor of biomedical engineering. Chien-Chi Lin's research focuses on pancreatic cancer, one of the deadliest forms of cancer. Pancreatic cancer has a five-year survival rate of 8 percent, and is projected to be the second leading cause of all cancer-related deaths by 2030. Lin's project, "BRAVE Hydrogels for Interrogating Cell-Matrix Interactions in Pancreatic Desmoplasia" is trying to identify targeted medicines to block the growth and spread of the cancer by disrupting molecules. He uses hydrogels to study how pancreatic cancer cells multiply and move, and adds that they eventually could be used to test medicines. 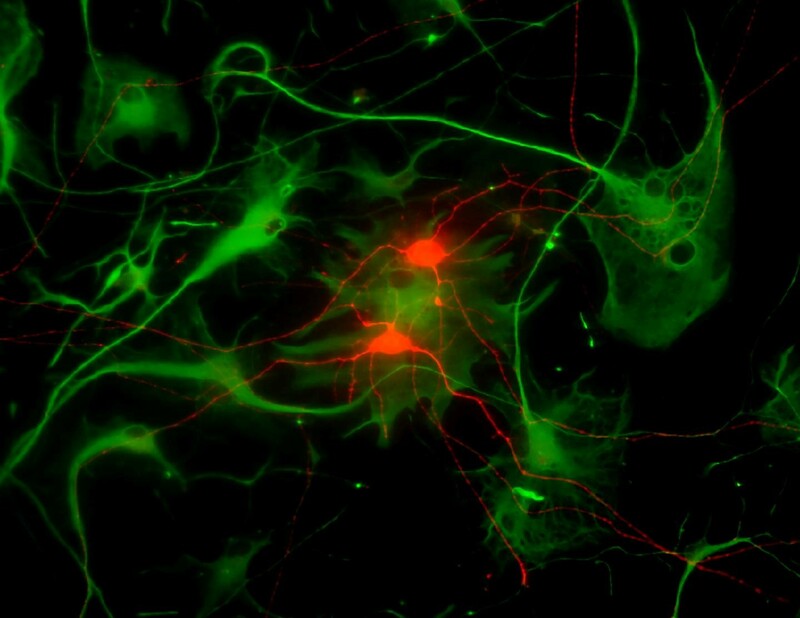 Lin uses gelatin and hyaluronic acid to create artificial tumor tissue to mimic the development timeline of the tumor cells. Results of Lin's work could provide awareness into cancer cell migration, along with a potential to target against metastasis. 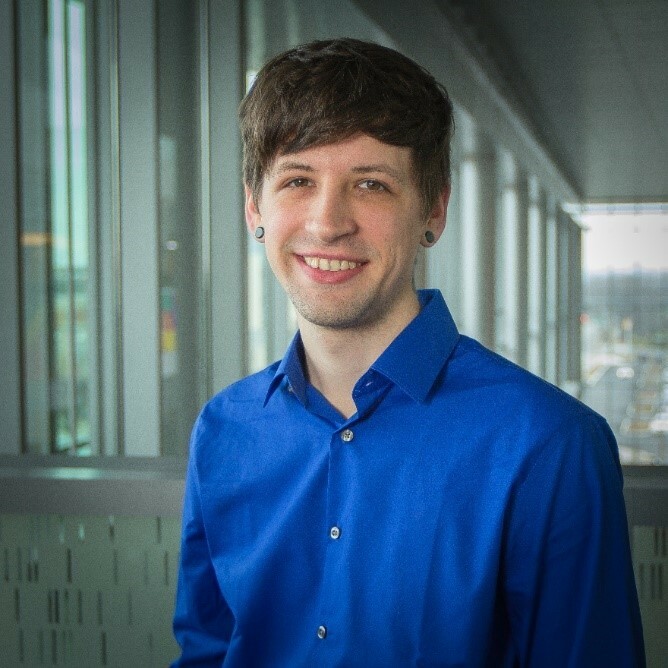 Click on this video produced by Myron Russell showing how Kyle Harris, a heath data science dual degree-seeking student in the Indiana University School of Informatics at IUPUI and the Richard M. Fairbanks School of Public Health at IUPUI, analyzes the numbers at his data science internship with ClusterTruck. IUPUI and TechPoint, the growth accelerator for Indiana’s tech ecosystem, have developed Xtern Semester, a pilot partnership that will integrate industry and university work-and-learn experiences for college seniors and pipeline them into tech employers. The program targets what Mike Langellier, TechPoint’s president and CEO, calls a foundational challenge of summer internships. "Work-and-learn apprenticeship programs are often used in the trades, and rotational co-op programs are common in mechanical engineering. But the tech industry has lacked the same level of threaded, work-and-learn experiences beyond traditional summer internships," Langellier said. “A challenge of summer internships is their short duration. By the time an employer fully onboards an intern, it’s time for them to head back to school. Simultaneously, students are deprived of an opportunity to make more money and acquire relevant work experience. "We wanted to change that by creating a framework and an inspiration that could scale to more students, more universities and more employers, leading to the ultimate goal of an even larger, year-round pipeline of talent into the Indianapolis tech ecosystem." Selected IUPUI rising seniors will start in TechPoint’s Xtern program, a highly competitive summer internship that received more than 1,800 applicants from 43 home states and 120 universities in 2018. Xterns pursue tech-skilled roles such as software engineering, data science and cybersecurity and business-skilled roles including marketing, sales and design. TechPoint matches them with an employer for a high-quality, well-paying internship, and they receive free summer housing at IUPUI among their peers and robust TechPoint-facilitated programming to help them experience Indianapolis, meet friends and develop professionally. "Over the past five years, only 19 percent of incoming Xterns said they were likely to work in Indianapolis after graduation. But after the program, 73 percent say they are likely to live in Indianapolis, and nearly 80 percent who receive job offers from their intern employers accept them. This illustrates the ability of the program, the tech community and the city to compel and convert talent when exposed to the opportunities," Langellier said. When students return to school for the fall semester, Xtern Semester participants resume their senior-year classes at IUPUI and continue to work at their employers 20-plus hours per week. This scheduling challenge has been made manageable because IUPUI will grant students academic credit for their work experience. This helps them retain a full credit load and stay on track toward graduation. Additionally, IUPUI will deliver supplemental workshops on soft skills and workplace readiness to help prepare participating students for success. A cohort of 12 IUPUI students will kick off the inaugural Xtern Semester, working at participating employers Angie’s List, Appirio, GEICO, OneCause, Renaissance Electronic Services, Sallie Mae, SmarterHQ, Vibenomics and Viral Launch. Initial conversations leading to the IUPUI and TechPoint partnership were facilitated by the state’s new Governor’s Workforce Cabinet. That entity has focused on ensuring alignment for Indiana’s workforce at all levels, from kindergarten to career, and has encouraged innovative partnerships between industry and higher education institutions. "Gov. Holcomb’s Next Level Jobs agenda emphasizes moving more students through meaningful work-based learning in our key industries to keep our red-hot economy strong and make sure Hoosiers aren’t left behind," said Danny Lopez, chair of the Governor's Workforce Cabinet. "Partnerships like this one between sector leaders and our incredible universities are a terrific example of how business and education align to keep our state humming." The Xtern Semester partnership was endorsed at IUPUI by Chancellor Nasser H. Paydar and the deans of the schools of engineering and technology, science, informatics and computing, and business, as well as career services. Jay Gladden — dean of University College, acting dean of the Honors College and associate vice chancellor for undergraduate education — said IUPUI’s partnership with TechPoint on the Xtern Semester program strengthens the university’s impact on the state. "Internships allow students to apply what they have learned in a classroom setting to real-world situations. They also teach students important workplace skills that complement their base of knowledge," Gladden said. "IUPUI educates more Hoosiers than any other campus in the state of Indiana. More than 90 percent of our graduates remain in the state, with approximately 75 percent staying in Central Indiana. This means that our efforts at IUPUI are directly connected to fueling the talent pipeline for Indiana and greatly contributing to workforce development and economic development imperatives." Funding for Xtern and Xtern Semester comes in part from employers, who pay wages and a small fee, and largely from a $5.7 million grant from Lilly Endowment Inc. that TechPoint received in 2017 through the Central Indiana Corporate Partnership (CICP) Foundation. TechPoint urges tech companies to tap into IUPUI’s homegrown talent pipeline for both tech-skilled and business-skilled students. Financial support for faculty research and scholarship during times when externally funded research programs are between grant cycles. 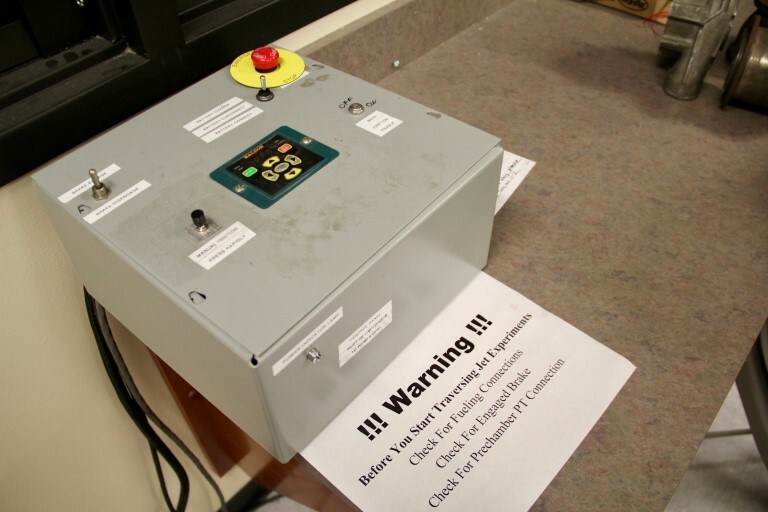 Equipment Funding Provides matching support for the purchase of major equipment that is not currently available at the campus level and will be shared by several faculty members from different departments and schools. 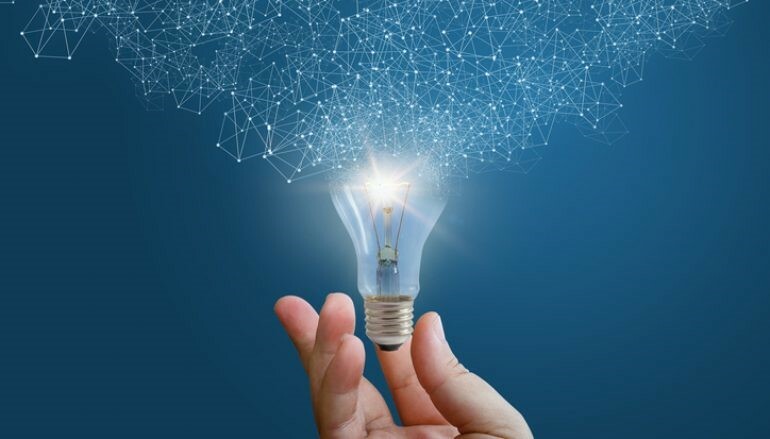 Funding Opportunities for Research Commercialization and Economic Success (FORCES) Projects that facilitate the commercialization of university-owned intellectual property, address important national and global needs, and support the economic development of Indiana and the nation. IUPUI Arts and Humanities Internal (IAHI) Grant Supports campus-wide attainment of excellence in research and creative activity in the arts and humanities. Research Support Funds Grant (RSFG) Provides seed funding for research projects and scholarly activities that are sustainable through external funding. Mechanistic Role of Skeletal Muscle SIRT3 in Remodulin-Mediated Improvement of Pulmonary Hypertension Associated Heart Failure with Preserved Ejection Fraction (PH-HFpEF). Funding opportunities in this section include current grant announcements from federal agencies for new initiatives and changes to existing programs. Announcements with limited scope are not listed here, but are sent directly to IUPUI School Deans. Methodology, Measurement, and Statistics (MMS): This opportunity supports the development of innovative analytical and statistical methods and models for those sciences. MMS seeks proposals that are methodologically innovative, grounded in theory, and have potential utility for multiple fields within the social, behavioral, and economic sciences. As part of its larger portfolio, the MMS Program partners with a consortium of federal statistical agencies to support research proposals that further the production and use of official statistics. Researchers need to think creatively regarding the development of methods for the production and use of data. Biological Anthropology Program–Senior Research: This opportunity supports basic research in areas related to human evolution and contemporary human biological variation. Research areas supported by the program include, but are not limited to, human genetic variation, human and nonhuman primate ecology and adaptability, human osteology and bone biology, human and nonhuman primate paleontology, functional anatomy, and primate socioecology. Grants supported in these areas are united by an underlying evolutionary framework, and often by a consideration of adaptation as a central theoretical theme. Proposals may also have a biocultural or bioarchaeological orientation. The program frequently serves as a bridge within NSF between the social and behavioral sciences and the natural and physical sciences, and proposals commonly are jointly reviewed and funded with other programs. Growing Convergence Research: For this opportunity, Convergence Research has 2 primary characteristics: 1) Research driven by a specific and compelling problem. Convergence Research is generally inspired by the need to address a specific challenge or opportunity, whether it arises from deep scientific questions or pressing societal needs; and 2) Deep integration across disciplines. As experts from different disciplines pursue common research challenges, their knowledge, theories, methods, data, research communities and languages become increasingly intermingled or integrated. New frameworks, paradigms or even disciplines can form sustained interactions across multiple communities. A distinct characteristic of convergence research, in contrast to other forms of multidisciplinary research, is that from the inception, the convergence paradigm intentionally brings together intellectually diverse researchers and stakeholders to frame the research questions, develop effective ways of communicating across disciplines and sectors, adopt common frameworks for their solution, and, when appropriate, develop a new scientific vocabulary. Research teams practicing convergence aim at developing sustainable relationships that may not only create solutions to the problem that engendered the collaboration, but also develop novel ways of framing related research questions and open new research vistas. NIDA Avant-Garde Award Program for HIV/AIDS & Drug Use Research (DP1): This opportunity supports individual scientists of exceptional creativity who propose high-impact research that will open new areas of HIV/AIDS research relevant to drug abuse and/or lead to new avenues for prevention and treatment of HIV/AIDS among drug abusers. The term "avant-garde" is used to describe highly innovative approaches that have the potential to be transformative. The proposed research should reflect approaches and ideas that are substantially different from those already being pursued. The NIDA Avant-Garde award supports innovative, basic research that may lead to improved preventive interventions or therapies; creative, new strategies to prevent disease transmission; novel approaches to improve disease outcomes; and creative approaches to eradicating HIV or improving the lives of those living with HIV. Areas of interest include innovative, basic research that may lead to improved preventive interventions or therapies; creative, new strategies to prevent disease transmission; novel approaches to improve disease outcomes; or novel strategies to improve the lives of those living with HIV; and creative approaches to eradicating HIV. The nexus with drug abuse should be clearly defined. Examples of studies of relevance to drug abuse include: studies using populations with significant numbers of drug users or samples from drug using populations; studies using in vitro systems and/or animal models that test the effects of drugs of abuse on HIV pathogenesis, progression, or treatment; and studies to develop interventions or treatments that are tailored to substance using populations. Proposed research should reflect ideas and approaches that are substantially different from those already being studied by the investigator or others. The program is not intended simply to expand the funding of an already supported research project, but rather to support highly creative researchers to pursue visionary concepts and approaches to research on HIV/AIDS. Deadlines: Letter of Intent: July 14, 2019; Proposal: Aug. 14, 2019. Improving Smoking Cessation in Socioeconomically Disadvantaged Populations via Scalable Interventions: The purpose of this opportunity is to provide support for highly innovative and promising intervention research designed to improve smoking cessation outcomes among socioeconomically disadvantaged populations. Specifically, efforts aimed at the development of smoking cessation interventions that: 1) are targeted to socioeconomically disadvantaged populations, and 2) could be made scalable for broad population impact. Applicants may propose projects that develop and test novel cessation interventions with the potential to be scaled up, as well as projects that focus on enhancing the effectiveness, quality, accessibility, utilization, and cost-effectiveness of currently scaled smoking cessation interventions. Biology of Bladder Cancer (R21 Clinical Trial Optional): This opportunity seeks projects investigating the biology and underlying mechanisms of bladder cancer. Bladder cancer is a significant global health problem. Because of the high incidence and frequent tumor recurrence, bladder cancer exacts an outsized medical burden. While recent progress has been made in the molecular profiling of bladder cancers and identification of mutated genes, relatively little is known regarding the molecular mechanisms driving initiation, progression, and malignancy of bladder cancer. Furthermore, our understanding of biological processes of the normal bladder at the molecular, cell and organ levels is limited. Fundamental knowledge of how molecular and cellular functions of the bladder are altered in cancer will aid our understanding of bladder cancer biology and interventions. Applications that involve multidisciplinary teams and use clinical specimens or investigate both normal and cancer processes are encouraged. The mechanisms by which environmental factors (arsenic, infection, and air pollution) affect bladder cancer development and progression. Humanities Connections: This opportunity seeks projects that address significant and compelling topics or issues in undergraduate education at the applicant institution; that these projects engage the intellectual skills and habits of mind cultivated by the humanities; and that faculty and students will benefit from meaningful collaborations in teaching and learning across disciplines as a result of the project. long-term institutional support for the proposed curriculum innovation(s). Strategic Research Award: The goals of this opportunity are to foster health services research and patient-oriented research in sleep medicine, to improve patients' outcomes and to demonstrate value. Awards are often focused on specific topic areas that will advance the field of sleep medicine. The topics for the 2019 Strategic Research Award include: Pediatric sleep-disordered breathing, opioid use and sleep-disordered breathing, use of telemedicine for patients with sleep-disordered breathing, circadian rhythms sleep-wake disorders, rapid eye movement behavior disorder and other parasomnias, the value of board-certified sleep medicine physicians and sleep medicine team members, collaborative care models across specialties, hypopnea scoring criteria, effects of workplace interventions on employee sleep health, artificial intelligence, and high-impact sleep research. Deadlines: Letter of Intent: March 04, 2019; Application: June 24, 2019.